Forecasted at a price tag of over $5 Billion and covering 10 million square foot, Teslas’s Gigafactory is set to revolutionize the entire energy industry, creating 6,500 jobs along the way. Planned for 2017, it will eventually produce more battery power each year than the total global 2013 output. Tesla has long been fighting economic and political backlash to allow a bigger integration and adoption of its cars, however through strategic vertical integration Tesla will set out to lower individual unit costs and become a mass-market automaker by 2020 able to produce more than 500,000 cars a year, a 1,328% upswing in their annual production. “The opportunity exists to revolutionize the current view and method in which we use energy, we could potentially experience a shift from pure mass consumers to conscientious managers of renewal energy, perhaps Mr. Musk holds the key to opening that gate”, Gonzalo Lopez Jordan and Santiago Steed Managing partners of Patagonia Financial Holdings mentioned. Tesla’s current batteries use two main minerals in their production, Lithium and Cobalt, each posing a different problem for the auto-maker. Cobalt’s main global producer is the Democratic Republic of Congo, whose political risk will probably cause an undersupply and volatility in future prices. Tesla could potentially use Manganese as substitute for Cobalt, however Lithium will undoubtedly remain an irreplaceable mineral in the production of their batteries. Tesla will have to guarantee an efficient supply of lithium to ramp up its production and to create a vehicle priced at a reasonable range to compete with other auto-makers. Under their current model, Tesla’s plant would have cost advantages approximated at lowering lithium-ion battery costs by more than 30 percent. Tesla currently has four final locations for its plant: Nevada, New Mexico, Texas and Arizona. The location will be heavy dependent on possible tax breaks and the proximity from suppliers. Nevada poses as an ideal candidate due to its vicinity with Tesla’s vehicle assembly plant and its high concentration of potential suppliers. Simbol, a sustainable materials Technology Company advancing the electric vehicle revolution with high performing lithium, manganese, and zinc battery materials extracted from the hydrothermal brine resources in Nevada, has also been highly quoted by analyst as a possible provider of minerals. Finding the resources for the project is the last piece of the puzzle which Elon will have to solve. Tesla will finance $2 billion but the remaining 60% will have to come from outside capital. “Under the current structure of financing for the plant, EB-5 Capital would constitute an exciting opportunity to capitalize the project.” said Gonzalo Lopez Jordan. “Especially given the job growth it could potentially generate” added Santiago Steed, both managing partners of Patagonia Financial Holdings. [2-3] Ohnsman, Alan, “Musk’s $5 Billion Tesla Gigafactory May Start Bidding War”. 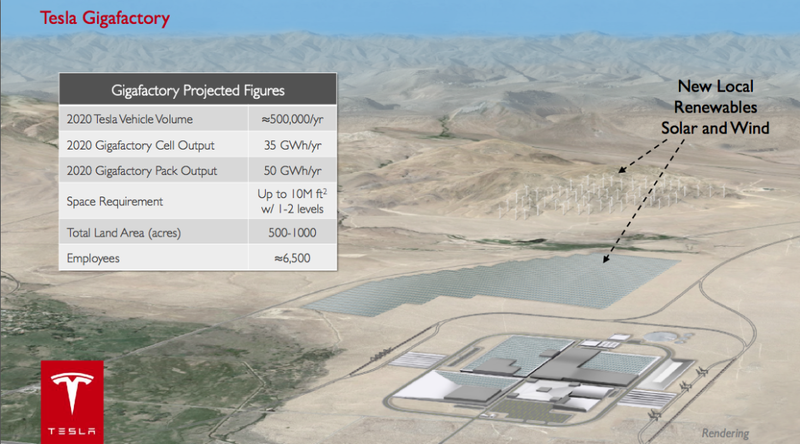 Available at:http://www.bloomberg.com/news/2014-02-26/tesla-plans-1-6-billion-note-offering-to-fund-gigafactory.html.